CC 1087 is a Leyland S4.36.T3 and was new in 1914. Previous registrations are LP 8597 and XA 8086. The Leyland body has 32 seats in Charabanc formation, and she carries fleet number 59. Some viewers may be wondering, and I can confirm that she is indeed one of the famous Sutcliffe restorations. She is seen at Duxford on 24 September 2000. A wonderful photo shot and vehicle restoration; charabancs have a real fascination for me. 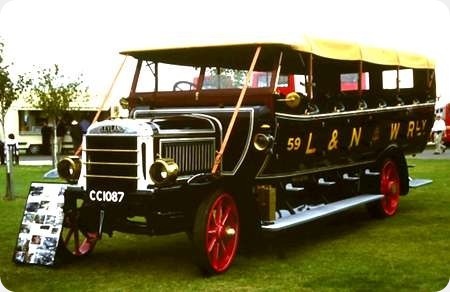 One tends to think of railway companies showing an interest in the rapidly expanding bus industry in the late ‘twenties and ‘thirties, but LNWR were really ahead of the game in 1914! I have to wonder, though, whether it was used for shuttle services, or tours (of the Lake District, perhaps. Assuming a fleet of at least 59 passenger-carrying vehicles, both types might well have been operated. 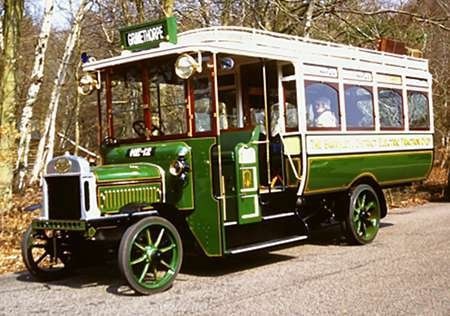 Here are two views of HE 12, a Leyland S3. 30.T from 1913. The body is a Brush B27F and she is in the livery of Barnsley & District (fleet number 5) – a precursor of the famous Yorkshire Traction. She’s seen on display at Longcross, near Chobham, on 1 April 2007. This was the London Bus Preservation Group event, normally held at Wisley airfield. Looks like one of Mike Sutcliffe’s immaculate restorations. Magnificent machine. Only 14 years before the TD1 appeared! I was at that event Pete and Ian, and the restoration of this vehicle is superb beyond description. Incidentally the annual "Cobham" event is no longer held at the windswept and inhospitable Wisley Airfield. 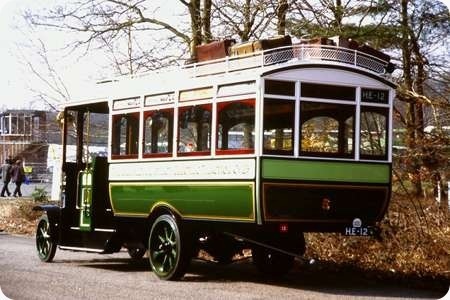 We went last weekend and it is now held at Brooklands Motor Museum, where the splendid new bus exhibition is now open. 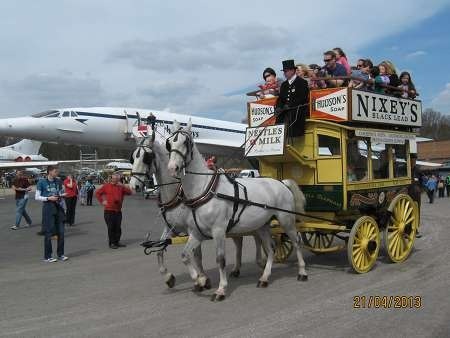 Did you notice, Chris, the careful positioning of the stop for the horse-drawn "STAR OMNIBUS" and Concorde? Quite a dramatic contrast! I did indeed Pete notice just the fascinating contrast that you mention, and here "hot off the press" is the picture I took on Sunday having had the same feeling about the wonderful "ancient and modern" scene. The horse bus was well patronised most of the day and its rather strange to reflect that it has stayed in service far longer than the ill fated Concorde. The beautiful Belgian horses must have thought that it was their birthday as they were plied with mints and biscuits by delighted onlookers at every "terminus." Great pictures Pete, thanks for posting. Thanks also to whoever has put in the work to achieve this result! At the rate fuel is rising in price, there could be a renaissance in horse buses! With such proud and beautiful horses, many would welcome it! A truly moving photo, Chris Y, and thx so much for posting it. 1) It’s a form of transport, it keeps the grass down, and feeds the roses. 2) It’s dangerous! The front bites, the middle sags, and the back kicks. I vote for option 1! …..but like any motor vehicle, Pete, option 2 only applies when there is misuse or abuse from the driver…..
Not sure about that David. I seem to remember that in the olden days, one of the first things children were taught was "Never go close behind a horse" – and it wasn’t for what might drop on your shoes either! Don’t forget, if you abused the mechanical gear change pedal on a pre-selector Daimler you got similar results as…. …. the back leg of an abused horse! 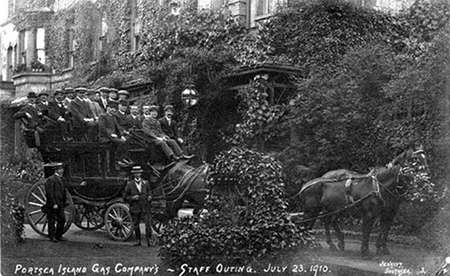 It’s always been a source of wonderment that horsebuses and the like often appeared to run top-heavy, yet didn’t turn over. However, maybe they did! An extreme example is this 1910 photo of a staff outing of the wonderfully-named Portsea Island Gas, Light & Coke Co., which is likely to have some 20 folk aboard, with perhaps one inside! I’m assuming that climbing Portsdown Hill was a No-No! "The Muggleton Inn" (Wetherspoon) in Maidstone displays a photo of D 9717 1913 Leyland acquired second-hand by Maidstone & District from an unknown operator in 1914. But Wetherspoon’s have wrongly captioned the photo as a Tilling-Stevens! I have produced a CAD Line drawing of this bus and would like to forward a copy to the owners. Does anyone know how to contact them?